Financial support and planning is a key issue for postgraduate students, with requirements differing from person to person. Find out what support is available to you. The School of Mathematics, Computer Science and Engineering is committed to providing financial support through a generous scholarship scheme to high-calibre UK, EU and International (Non-EU) applicants, who hold a first class honours degree or equivalent. Scholarships are offered to well-qualified applicants wishing to take up a place on a selection of postgraduate courses. The scholarships, each valued at £2,000, are intended to assist students to pay the fees for their chosen course of study. To see all scholarships opportunities available to applicants, consult the Scholarship search tool. Fees can be paid in two instalments: 50% (minus the deposit) at registration and 50% in January. Fees can be paid online (as part of the online registration) or by cheque or bank transfer. We recommend that you budget to spend between £11,000-15,000 per year on general living costs inclusive of rent, food, heating, travel, clothes, books, etc. If you hold an offer for a master's course you will be asked to pay a non-refundable deposit to secure your place. This will be considered as part payment towards your tuition fees. Alternatively you can choose to pay the first instalment (50% of tuition fees), or full course fees, which will later allow you to complete the online registration when it is active from mid-summer 2019. Please refer to the Offer Notes you have received with your Offer Letter for the Deposit Payment Deadline. To pay your deposit, follow the link within your Offer letter. This deposit is only refundable in line with City’s standard Terms and Conditions (link is included in your Offer letter). Where your offer is conditional and you do not meet the conditions set, City will refund the deposit paid in full. If you are fully sponsored by an external organisation, you do not need to pay a deposit. Please visit this webpage to obtain a sponsorship form (SP1) and return to both registration-finance@city.ac.uk (address given on the form) and smcsepg@city.ac.uk. If you require any support in this process, the Income Team will be able to help you. For further information, please visit their pages or email registration-finance@city.ac.uk. We recognise that our students have different financial circumstances, and planning how to fund both your tuition fees and living expenses differs from person to person. Our Funding and Financial support pages will give you details of the various options open to postgraduate students in funding their study. 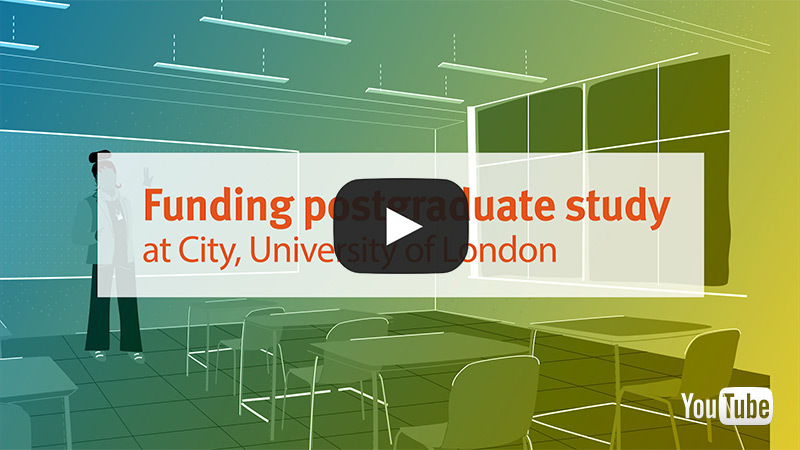 There's a range of funding opportunities available at City, University of London to support you.